About the activity: This activity is called "The Iron Way". There are two courses. One course for beginners is 140 meters, and the other slightly more challenging course is 220 meters. This activity is meant for beginners. Climbers don't need any previous climbing experience, nor do they need any climbing skills. 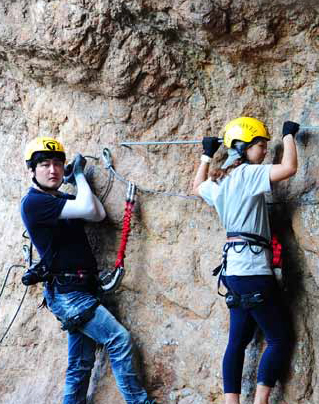 All safety equipment has been previously installed, and climbers safety equipment is provided. Price: 140 meter course - 40,000 won per person. The reservation deposit is 6,000 won. The remaining 34,000 won is due at the site. 220 meter course - 45,000 won per person. The reservation deposit is 6,000 won. The remaining 34,000 won is due at the site. Other activities: You can also book bungee jumping, ATV riding, paintball, rafting, and the slingshot by clicking the "book now" button.